Ever find yourself on a job site with a low battery in your phone, and no working outlet anywhere? If you have the PoweriSite in your pocket, there’s still hope for you. 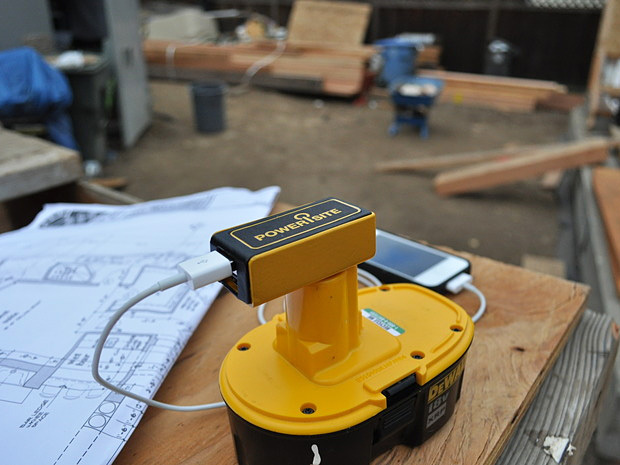 Plug it into the batteries that power your cordless tools, and plug a USB charger right into it. Just like that, you’ll be ready to make calls again in no time. It’s $18 on pre-order with delivery later this year. 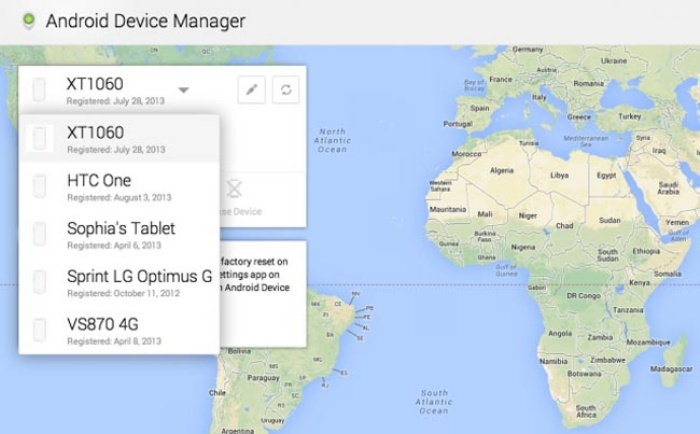 There’s the Find My iPhone app for iPhones, and now there’s the Android Device Manager for Android devices. This has definitely been a long time coming. Google finally launched the service, which will help Android device owners to find or locate their missing (or worse, stolen) smartphones and tablets. By Hazel Chua on 07/08/13 • Leave a comment! Germs are everywhere. They’re in the air, on the things you touch, on your smartphone’s screen… And if you’re the type who freaks out at the mere notion of germs, then you probably carry disinfectant with you everywhere you go. You can minimize contact between your face and your phone’s screen by getting a headset, but some people find them a hassle to use or carry around. iPhone stands are infinitely more fun if they’re made in Japan. 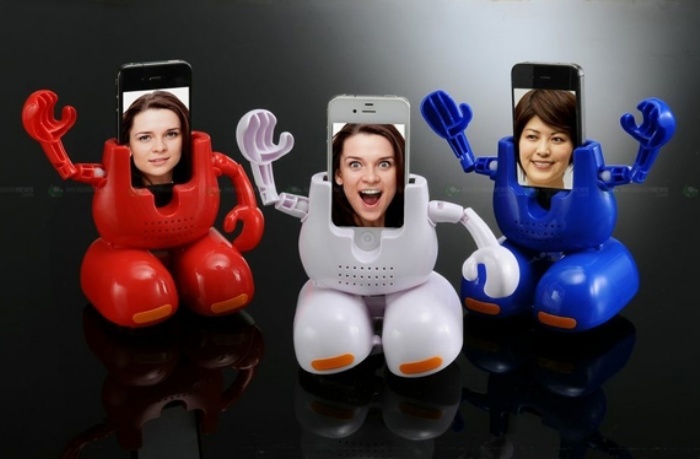 This particular one called the Dancing Face Stand by Takara Tomy dances to the tune of whatever music you choose to play and features your face prominently on your phone’s screen. All you have to do is fire up its companion app called FaceSing, take a photo, choose and set the music, and then watch the bot-like stand do its thing. Hit the break for a video that shows off the stand in action. It’s silly, it’s oddly adorable, and it’s a whole lot fun. By David Ponce on 03/13/13 • Leave a comment! A Stirling Engine is one of the world’s oldest, having been conceived in 1816 as a rival to the steam engine. It uses differences in temperature to drive a piston back and forth, turning a flywheel in the process. 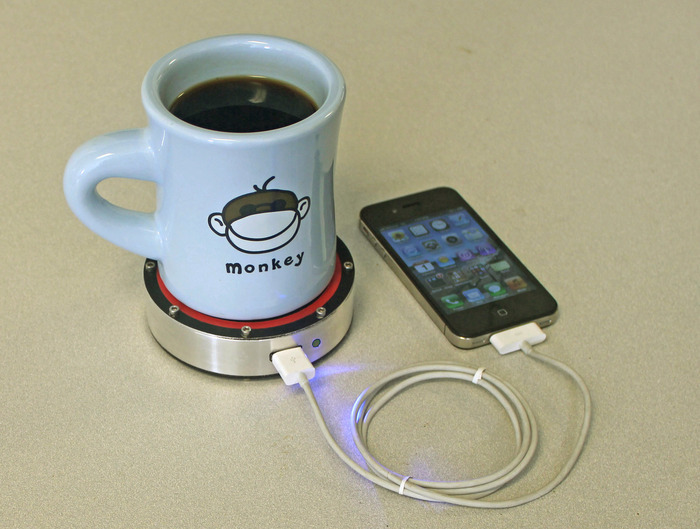 It’s this engine, albeit a tiny one, that sits inside the onE Puck you see above, and which allows you to charge your USB-connected device using nothing but the heat of your coffee cup. Or the cold of your iced tea. Just place any sufficiently cold or hot object on top of the onE Puck, and the Stirling engine will kick to life, driving a tiny generator. Obviously the hotter (or colder) the object, the more efficient the onE Puck becomes, but it’s designed to generate 5W of power at a combination of 1,000mA and 5Vdc. That’s standard for a phone charger, but these are clearly ideal conditions. It might generate this much at peak performance, when you’ve placed a piping hot drink, and then slowly lose its charging power. There’s an internal battery which accumulates charge, and delivers it in batches to your connected device, so it may appear as though it’s not charging at times, but it’ll kick in eventually. It’s slow and steady, rather than fast and efficient, and is more of a novelty than anything else. 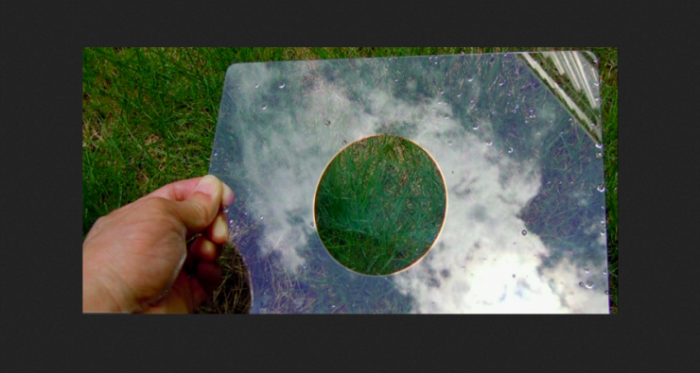 But as a Kickstarter project, it’s been successful enough to raise $125,000 with 23 days to spare. If you want yours, you’ll have to pledge $115 and expect delivery in one year. By Andrew Liszewski on 10/12/10 • Leave a comment! 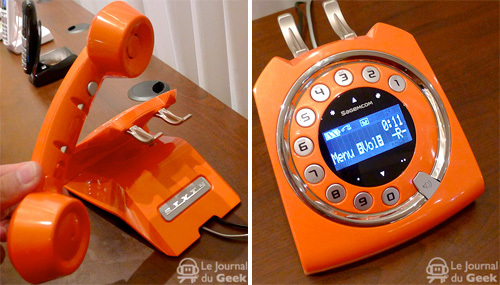 I can’t say I’ve been caught up in the retro trend that Mad Men has inspired (probably attributed to never seeing a single episode) but I likes what I likes and this Sixty phone from Sagemcom strikes a nice balance between retro and modern. 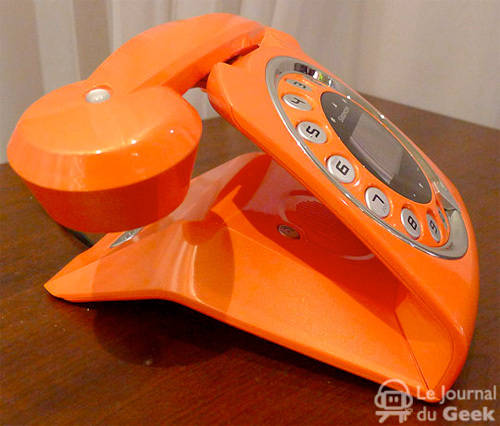 It will be available exclusively from Orange in France for ~$125 (€89.90), hence the color, and the retro stylings are countered with such modern features as a wireless handset, built-in answering machine, dot-matrix LCD display, 150 entry phonebook and 10 different ring styles. I’ve long enjoyed my Google Voice account, as I was one of the lucky people who got in on it while it was still GrandCentral. Unfortunately it has been rather difficult to obtain an account since Google took over, and there were worries that they may simply shut down the service one day. 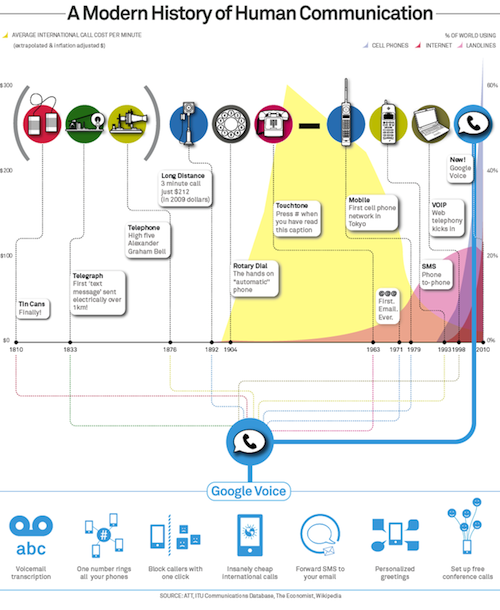 Well we shall worry no further, as the company has officially taken Google Voice out of beta. That’s right, you can simply head over to the Google Voice page and sign up for an account (as long as you’re in the US, that is). If you already have a Google account, then you need only pick out a number. Then you can start enjoying features like free SMS, transcribed voicemails, and having a single number ring all of your phones. Seriously, go sign up now! How many of you are guilty of dropping your phone into a pool of water? If you’re one of the lucky ones that have not, just wait. One of these days your precious device will end up in the toilet, sink or possibly an actual pool. Generally when this happens, you’ll try and dry it out and hope for the best (which doesn’t always work out so well). The best method I know of is to toss it into a bag full of rice, which should absorb a good deal of the water. 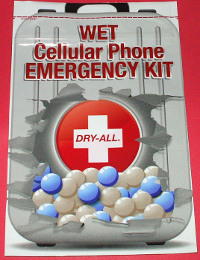 Another option is to have a couple of these Wet Cellular Phone Emergency Kits on-hand. The bag contains some sort of super-absorbent material that, much like the rice, will take the water out of your phone. When disaster strikes, you simply tear off the top, toss in the phone (or any other small electronic device) and zip it shut for a couple of days. Crossing your fingers and praying to your choice of deities never hurts either. At $10 a pop, I’d say it’s worth keeping a couple around. If it does work, you’ll save a lot of cash over buying a new phone. It looks like AT&T has hopped on the eco-friendly bandwagon. They have announced a new mobile phone charger dubbed the Zero Charger, which is supposed to be the greenest of its kind. It’s common knowledge that many devices will still draw power, even after their battery has been fully charged. 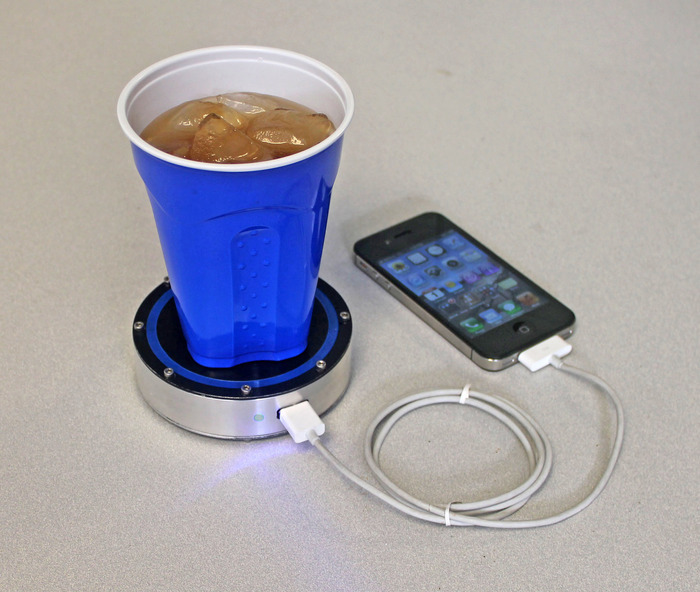 This USB charger is supposed to cut off the flow of energy as soon as your device is juiced up. To take things a step further, AT&T is delivering the device in a recycled-cardboard container. They’re really hoping that environmentalists won’t have anything to complain about with this one. The only question left is whether it’s as friendly to your wallet as it is to the Earth. We should find out when it hits stores in May.